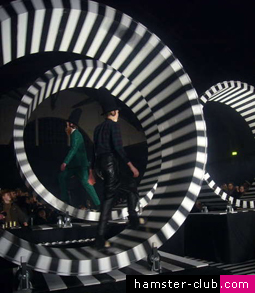 These awesome black and white, striped, human-sized spinning hamster wheels were part of the runway set design for Danish fashion designer Henrik Vibskov�s Fall collection at Copenhagen Fashion Week. The designer is known for his quirky and artsy show happenings, including a mint green blow up silk runway, a model pedaling bike-machine and a tent city scape. Those are just a few of the extraordinary back drops for his amazing fashion collections that are sought after by fashionistas in the know around the world. 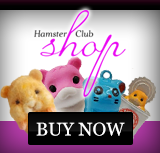 By now Henrik Vibskov is an established designer brand for men�s and women�s wear. Mr. V himself is known for his wacky collections with a strong use of color and humor along with his strong graphic ideas and artistic collaborations that transcend fashion, design and art.